Check further below for pdf-files of the core courses´ syllabi and schedules. 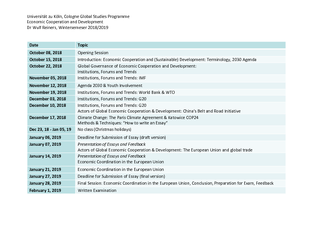 Click here to find the preliminary schedule for the summer term 2019! The final exam for the Basic Module 1 will take place on February 1st at noon. Important note CGSP students: While the exam is not graded, you will all receive grades for the performances in the single core courses. 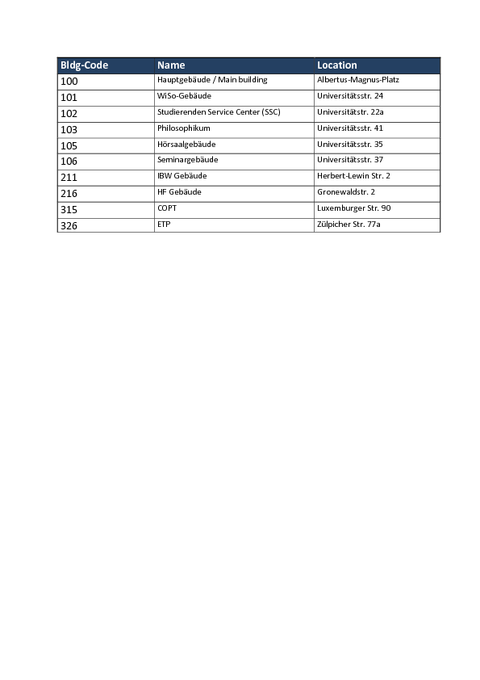 These grades combinded will mark the grade for the Basic Module 1, given that the exam was passed. 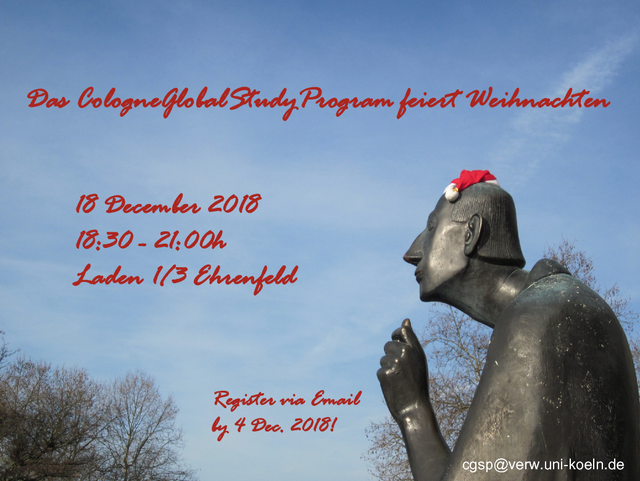 Click here for more info on this year´s Xmas get-together! 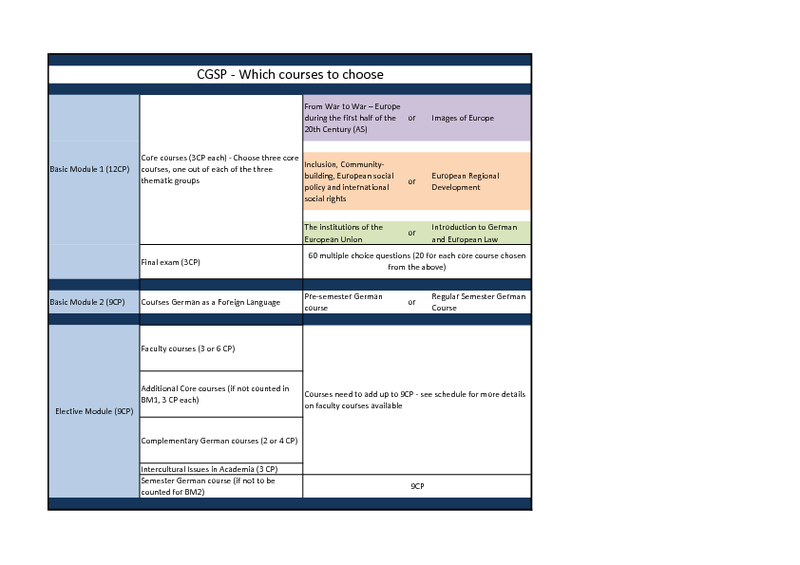 The pdf will show you all the detailed information you need to have on the CGSP core courses and the course "Intercultural Issues in Academia". Keep in mind that showing up in the first session is mandatory in order to secure your spot in the class! We will be offering a webinar for all winter term students of the CGSP that need support in the registration process on Klips. Access information has been sent out via email. 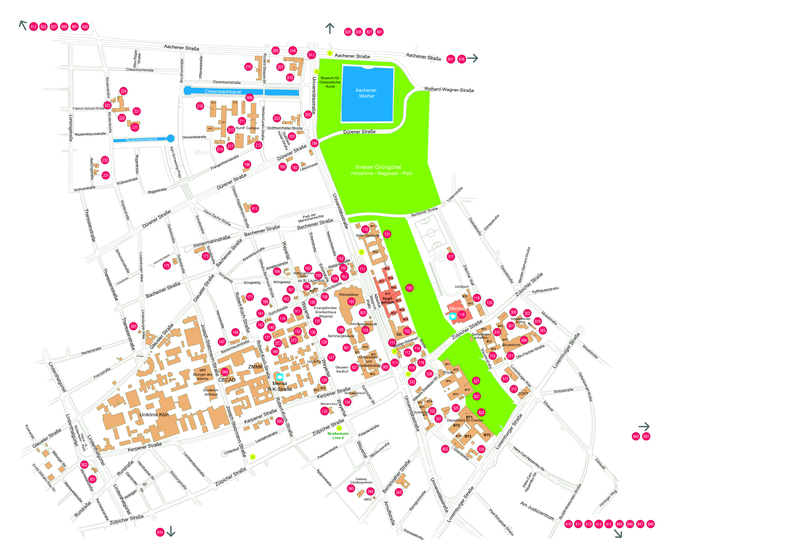 If you didn´t receive it, contact us via emai..
Get all the infos you need! We are looking forward to meet you at the general welcome session for exchange students on Wednesday, Sep. 5th, and our CGSP info session on Friday, Sep. 7th! Where to go? See our building list and the campus map for details! Registration is only possible after you have full access to your Klips-account! That means you must have received your access data for your smail-account and log in with your @smail.uni-koeln.de email adress! Loggin in with your application email-adress (home email-adress) allows you restricted use only. Detailed instructions on the registraton process will be given (among other informations) during the semester-prep-session on September 7 (details to be announced). The course provides an introduction to global and European economic cooperation and its relationship with sustainable development. It concentrates on two main components. First, we will analyse the contemporary global architecture for economic cooperation and development and its main characteristics, including relevant actors, international organisations, treaties, and patterns in trade and development economics. Second, we will examine the European Union as an example of regional economic integration, its internal market, the framework for economic coordination and its external economic relations. 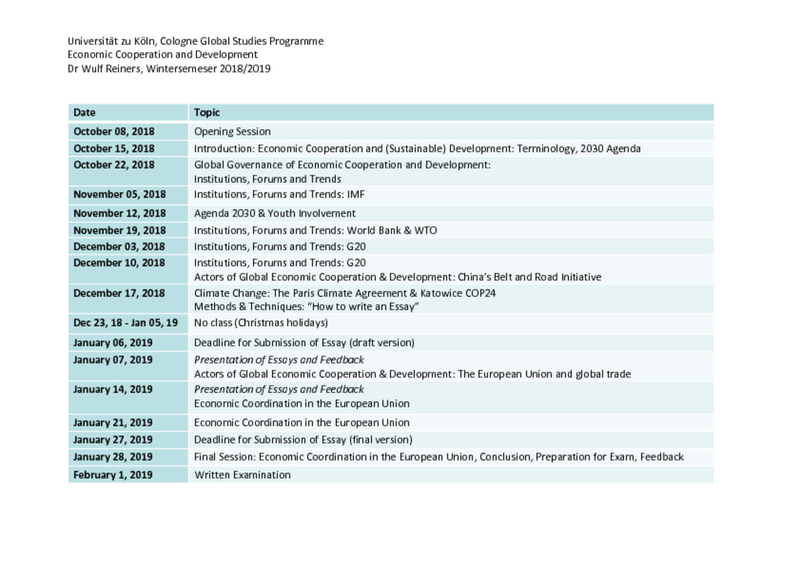 The course will take up topical economic and political processes such as the United Nation’s 2030 agenda for sustainable development, China’s Belt and Road Initiative and the EU’s trade and economic partnership agreements. In this way, the course seeks to contribute to the understanding how economic cooperation and development are interconnected with environmental and social questions. Inclusion does not happen overnight. We can not understand inclusion as if we switch on and off the light. Beyond legal frameworks and economic incentives as important preconditions to generate social change by Pareto-optimal solutions in allocation, successful inclusion is a process of social change understood as cultural transformation. Inclusion as metamorphosis (Gestalt-switch) of the collective agreement about the question of a good life needs time but during this time-span, society has to organize social learning processes that transform the psychodynamics of individuals and the cultural grammar of exclusion. This broad problem has to be located in the legal context of the EU and the UN, connected with the national legal regime development in the structure of multi-level-system with final results on the local level. The process of integration among sovereign nation states embodied by the European Union (EU) is a unique attempt of organising the co-existence of peoples. The EU’s sui generis character – something between a federation of nation states, or “Staatenbund”, and a federal state, or “Bundesstaat” (which led the German Constitutional Court to invent the term “Staatenverbund”) – makes the EU an ideal test case for political scientists interested in international cooperation. Although the EU is used to sailing rough seas, recent years have seen a succession of apparently existential crises and frantic reforms. Most recently, Brexit – the first-ever exit of a Member State – may form a watershed moment for the Union as a whole. At the very least, it implies that fast-paced institutional adaptation will continue. 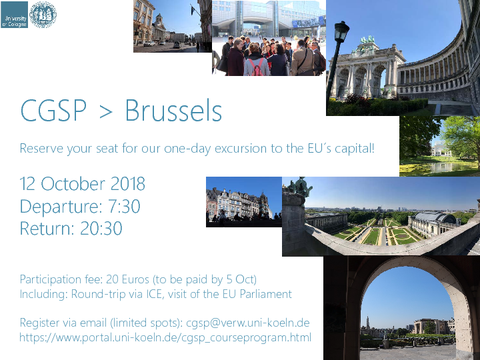 For example, a number of proposals have been tabled on how to deal with the UK’s 73 alloted seats in the European Parliament, which will likely become vacant just before the upcoming European Elections in May 2019. Against this background, the seminar aims to take a closer look at the political structures underlying the EU. Based on a systematic appraisal of the Union’s institutional foundations, its strength and weaknesses will be the subject of debate and assessment. In particular, the seminar will include two sessions organised along the lines of a Tilbury debate. Students will controversially discuss a statement in two teams and try to defend a point of view that is not necessarily their own. 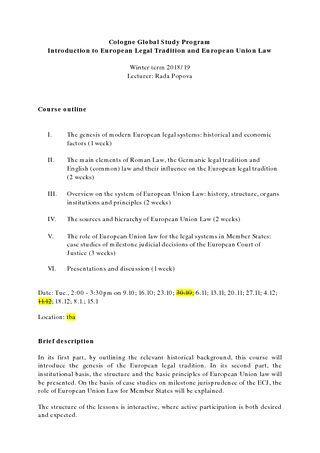 In its first part, by outlining the relevant historical background, this course will introduce the genesis of the European legal tradition. In its second part, the institutional basis, the structure and the basic principles of European Union law will be presented. 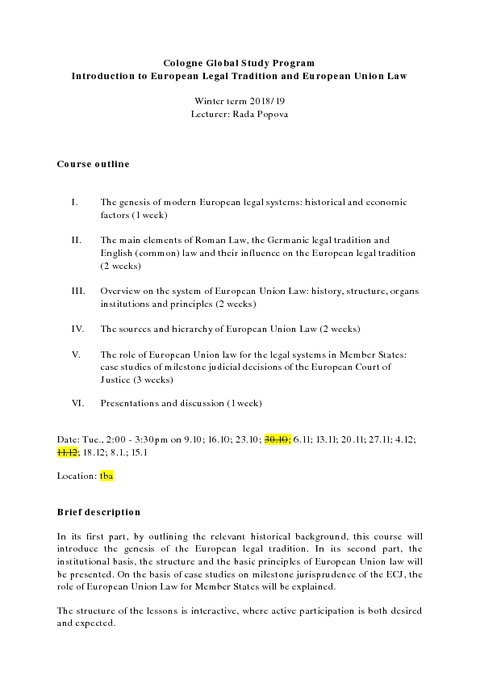 On the basis of case studies on milestone jurisprudence of the ECJ, the role of European Union Law for Member States will be explained. In the end of the course, every student will prepare a topic and present the results in front of the course (10 to 15 minutes). After the presentation, the topic at hand will be discussed among the class. The course will be concluded with a short multiple choice exam. European History during the 20th Century has been described as an “Age of Extremes” (Eric Hobsbawm), as a period in which the “Dark Continent” (Mark Mazower) went “to Hell and Back” (Ian Kershaw) and then had to be rebuild “Out of Ashes” (Konrad Jarausch). This is all the more surprising as the 19th Century seemed to forebode an age of culminating progress, characterised by scientific triumphs, civilizing achievements, accelerated discoveries and technological solutions for all problems and needs of mankind. Yet, the 20th century saw the most barbaric set-back Europe had experienced for ages: Two world-wars, slaughter and repression of entire people and populations, excesses of intolerance, hate and violence, dictatorship, tyranny and the spectre of nuclear apocalypse. Examining the first half of the 20th century is examining how Europe arrived at the edge of self-destruction. It also means to identify the lessons to be learnt by successive generations – as at least in part the second half of the century is reacting to and trying to avoid the errors of the first half. 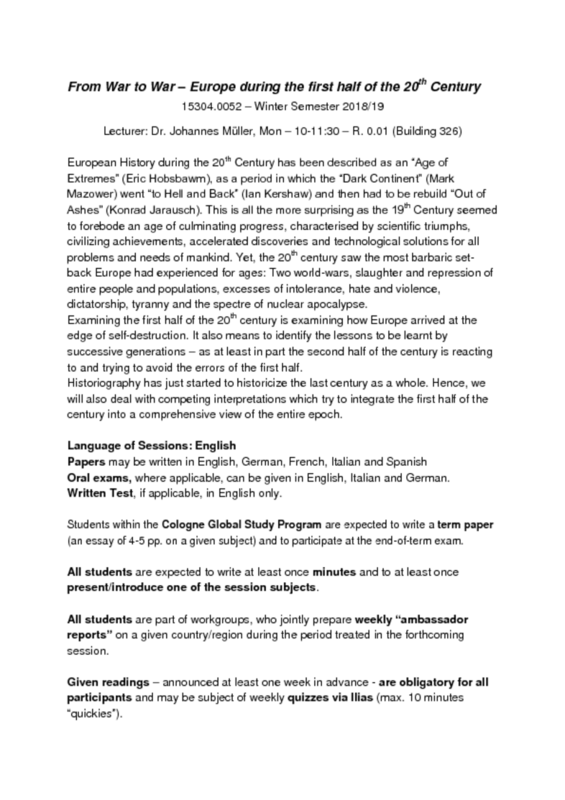 Historiography has just started to historicize the last century as a whole. Hence, we will also deal with competing interpretations which try to integrate the first half of the century into a comprehensive view of the entire epoch. 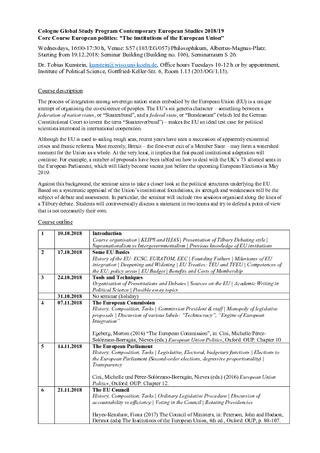 Euroscepticism is in vogue all over Europe. In addition, pictures seem to be omnipresent. As icons, they have a significant, maybe even overriding impact on the perception of public and private spaces as well as on private and political communication. In fact: iconographic communication is an integral part of the history of humankind. In this sense, pictures have a decisive influence on the idea of Europe. 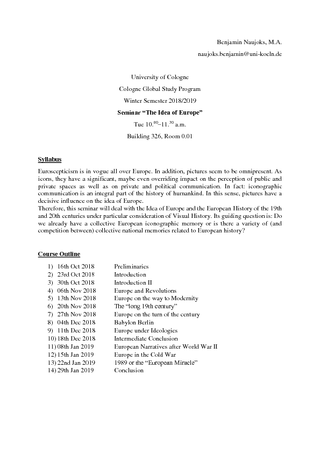 Therefore, this seminar will deal with the Idea of Europe and the European History of the 19th and 20th centuries under particular consideration of Visual History. Its guiding question is: Do we already have a collective European iconographic memory or is there a variety of (and competition between) collective national memories related to European history? Intercultural encounters in an academic context can be challenging and beneficial at the same time. In this seminar, international and regular students of the University of Cologne will be introduced to methods and theories as to how to make the most out of an international academic environment in practice. Nowadays, intercultural competence is needed not only in professional contexts but has become a necessary tool in everyday life as globalization and migration are shaping our lives. 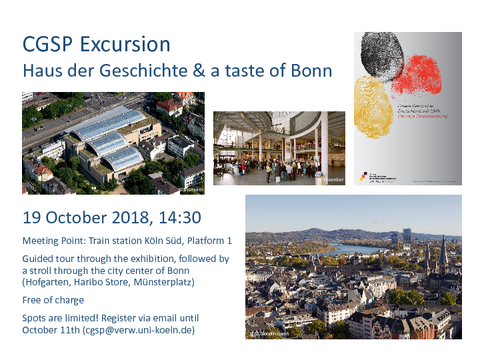 The seminar has a unique set-up: It is divided in two groups, one consisting of international students from partner universities of the University of Cologne and Erasmus, the other of regular students students. During the first half of the semester, the two groups will work separately in order to allow specific, tailor-made input for each group. 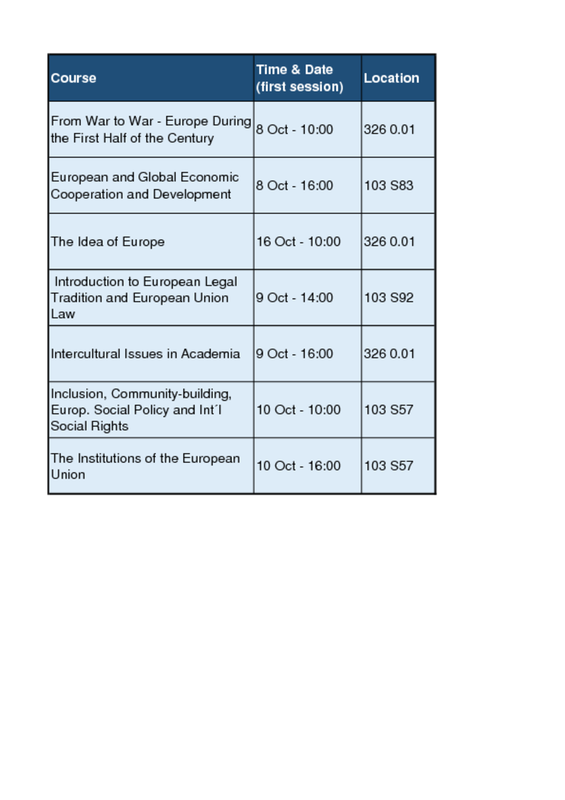 The second half of the semester, the groups will be combined to fully benefit from the intercultural setting. 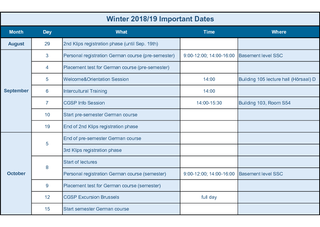 The content of the second half semester is subject to change depending on the wishes and needs of the students. All core courses can also be chosen for the elective module. For more information on the modules (basic and elective) see pages 7-9 of our brochure. The CCLS Lecture Series offers a forum to linguists from many different areas to present findings from current research. In this way, students will have access to up-to-date work done locally at the University of Cologne, as well as to work done internationally. 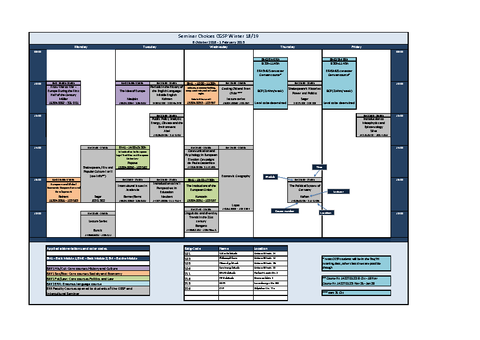 Topics will cover a variety of languages, methodological approaches, and theoretical perspectives (see course list for detailed information). Individual class sessions will be divided up in a lecture part and a question and answer session. Open to all interested. 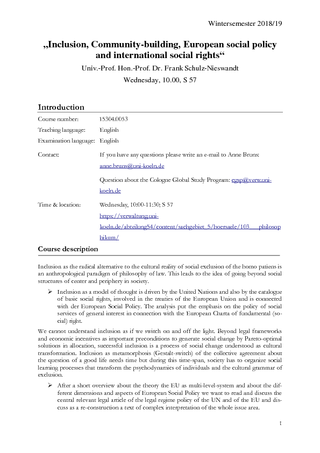 This course outlines the basic arguments, theories and developments of contemporary Economic Geography. It is meant to give students first insights into this highly dynamic and empirical science. Starting from core processes in our modern economic and social world like globalization and uneven development, we will deal with questions of economic growth, inequalities and economic change on different spatial scales. We will get to know basic spatial theories and use them to describe and explain various empirical examples from dif-ferent regions. A special focus will be set on the role of knowledge and innovation in contemporary economic developments and on the challenges for developing regions like East-Asia. Note: This course is combined with the lecture "Economic Geography", taking place at the same at the same place. Just make sure to register for both, the seminar (14351.5001) and the lecture (14351.5000), in order to receive the total of 6CP. It is NOT possible to pick just one. Middle English is the period in the history of English which starts after the Norman Conquest and gradually turns into Early Modern English during the second half of the 15th century. Middle English is often described as a period of rapid transition and considerable heterogeneousness. It is also a phase with an extremely rich output of texts, both literary and non-literary. This lecture will deal with the important developments in the fields of spelling, phonology, morphology, syntax and lexis, but will also focus on topics involving Middle English society and culture and the major genres of the period. The seminar will offer an introduction to internationally influential debates in education in the wake of John Dewey (1859-1952). It will be combined with the international conference "Democracy and Education Reconsidered", Dec 2 and 3, 2016 that will compensate for 8 regular meetings. 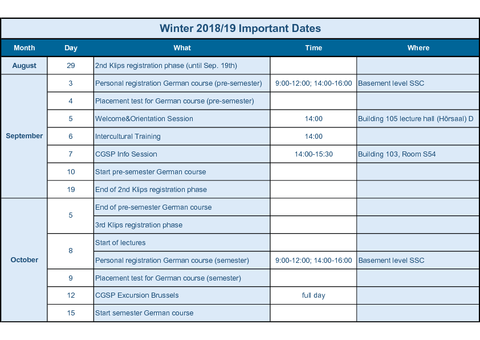 Remaining spaces in seminars of the Cologne Center for Comparative Politics (CCCP) are *not* allocated via KLIPS2 during the "Restplatzvergabe". If you do not have a place in this seminar, participation in the first session is strictly mandatory. Available spaces will be allocated there. 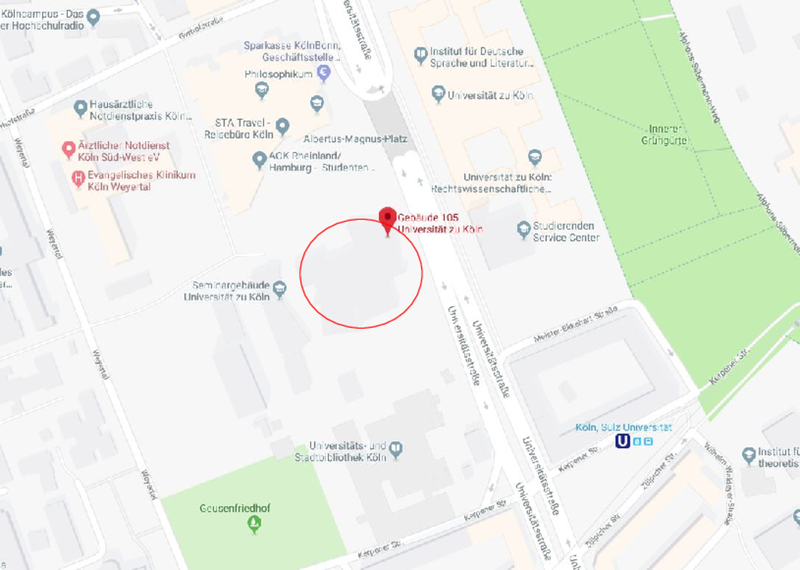 Course description: This seminar is an introduction to the comparative analysis of political institutions exemplified by the case of the Federal Republic of Germany. We will devote the single sessions to explore how formal and informal institutions influence the behavior of actors within a political system. The syllabus covers four major subject areas: To begin with, we focus on electoral systems and voting behavior (I). Amongst other questions, we examine how and why different electoral systems evolve. 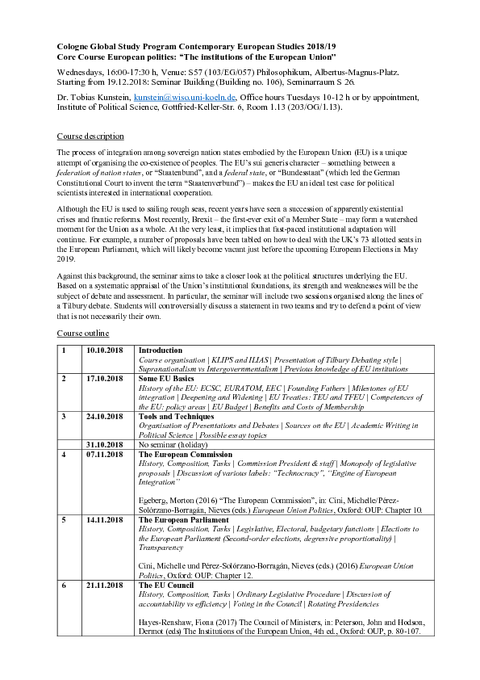 In the second part, dedicated to interest aggregation and representation (II), we take a closer look at political parties, interest groups, and the media as well as their relationship with state actors. Coalition and veto player theories are subjects of the third block for which we look at political actors governing between conflict and consensus (III). We apply the veto player approach to discuss and explain policy evolvement and change. Furthermore, we compare and contrast theories on coalition building and assess, for example, how well they can predict coalition outcomes of national elections. The last part of the seminar, multi-level governance (IV), focusses on interdependences between different political levels. Particularly, we highlight the mechanisms and effects of federal systems and Europeanization. The overall aim of the seminar is to gain a deeper understanding of essential processes, structures and the behavior of actors within political systems by means of general political theories. Additionally, we focus on the individual steps of developing and executing a research project in order for participants to be prepared to write their own term paper. This seminar will introduce you to the plays of Shakespeare’s first and second tetralogies: Richard II, Henry IV, Parts One and Two, Henry V, Henry VI, Parts One, Two and Three and Richard III. The seminar will consider key themes, including kingship, power and authority, national and regional identities, sexual politics, war, and ideas of community. Bringing matters up to the present day, the seminar will deploy a range of media resources, including film and performance archives, to consider the ways in which these plays continue to resonate and reverberate in the modern era. The relevance of the history plays within new social and political contexts and in new eras of war and conflict will be the focus of analysis, allowing us to think about Shakespeare in performance, on the screen, and in various forms of adaptation. 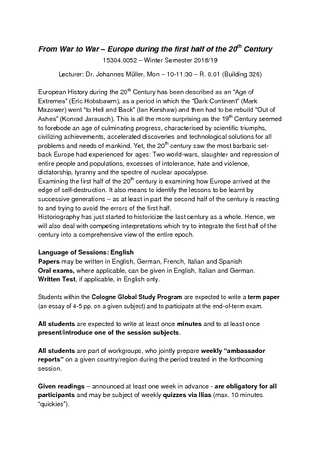 This seminar, including course materials and class discussions, will be in the English language. This course explores the remarkable variety of ways in which Shakespeare's life and works have been adapted by contemporary film directors. The course asks what happens when Shakespeare is popularized, and when the popular is Shakespeareanized; it queries the factors that determine the definitions of and boundaries between the legitimate and illegitimate, the canonical and the authorized and the subversive, the oppositional, the scandalous and the inane. This seminar series will discuss the ways in which the plays of Shakespeare, as well as Shakespeare himself, have been interpreted and reinvented, adapted and parodied, transposed into another media, and act as a source of inspiration for film-makers worldwide. Getting Old and Even Older – Pathways to Longevity and Implications for Society. Research and Experiences from Japan and Germany. Longevity – one of humankind’s all-time goals and desires – turns out to be boon and bane. Japan and Germany are among the countries, where not only individuals tend to get old and older, but the entire society is aging and has to adapt to a substantial demographic change. With a life expectancy of 85 years in Japan and 81 years in Germany and an almost identical average age of 47.2 years of populations in both countries, Japan and Germany share common problems and challenges. Individual longevity implies an increase of aging-associated diseases, a growing need for age-appropriated environments and living conditions, higher demand of elder care, public health care and pension funds under stress, financial pressure on taxpayers, strain on the labor market and many more issues to be dealt with from medical, political, social, economic and legal points of view. This joint lecture series will present some of their results in a comparative Japanese German perspective. Each lecture will be held jointly by a German and a Japanese expert, giving insights into ongoing or recently completed research projects. Students in both countries are invited to interact and actively participate in the discussion by posting comments and questions during the lecture. In the first part of this course our main interest will be in philosophical questions about the nature of time, the identity of persons across time, and the conditions for free will. 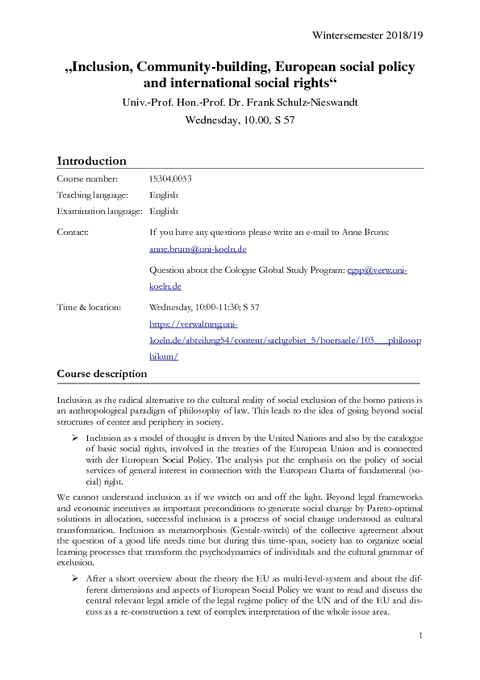 In the second part of this course our main interest will be in questions about the nature of human knowledge: what is knowledge, what are our sources of knowledge, and how–if at all–we can show that we have knowledge and deal with the problem of skepticism. Throughout the course there will be various introductory lectures on inductive and deductive logic. Please check the documents below for detailed course descriptions. Available are only those courses that run under the management of the Cologne Global Study Program. For Syllabi of faculty courses, you need to check the info on Klips or in the corresponding institute.